The complaint was reported here and the detail is here. 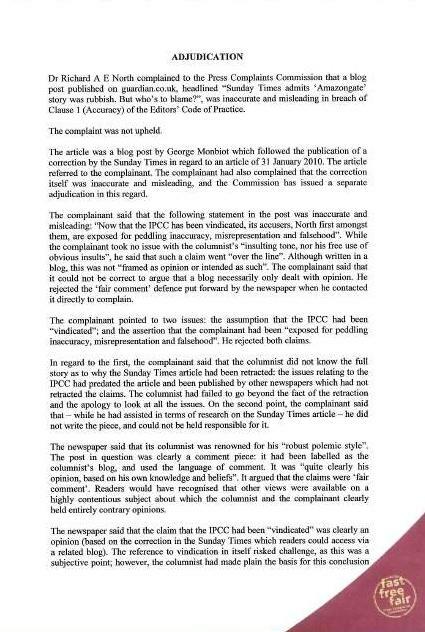 The response, just received, is below – in JPEG format as the PCC file will not allow copy and paste (click to enlarge). 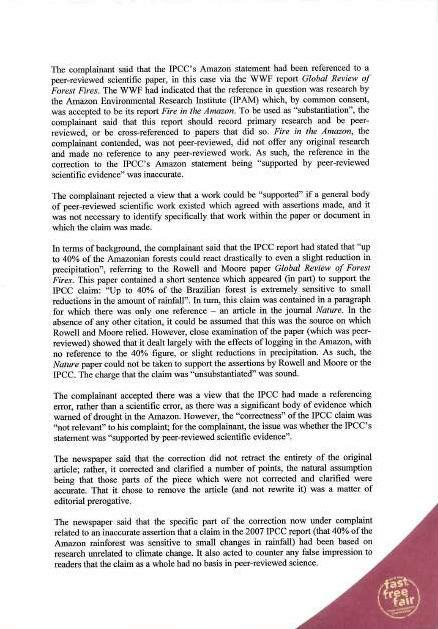 The complainant said that the correction was inaccurate and misleading by stating that the "IPCC's statement is supported by peer-reviewed scientific evidence" because it was not "supported" in the sense which is accepted by scientific convention. 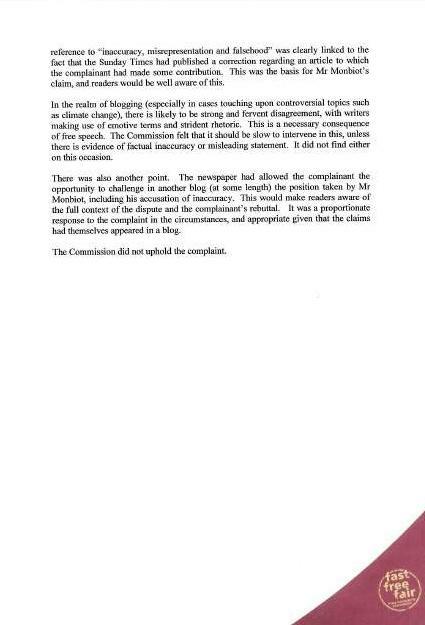 However, the Commission was of the view that the newspaper (Sunday Times) was entitled to express the correction in layman's terms. 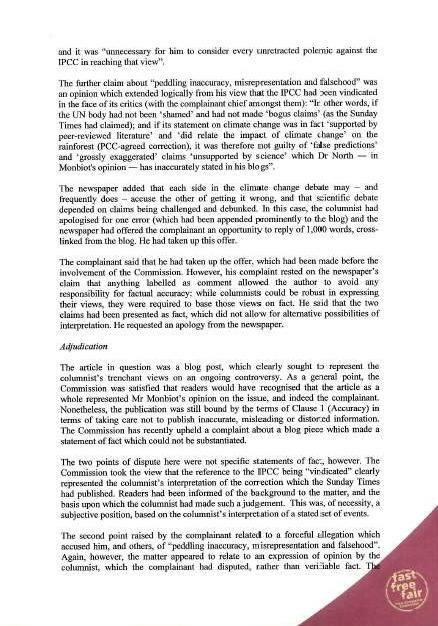 The Commission noted that the newspaper was able to demonstrate that peer reviewed studies existed which, arguably, could be said to "support" the thrust of the IPCC's statement in a more general sense. The correction did not claim that the IPAM research had been properly referenced or was in itself peer-reviewed. 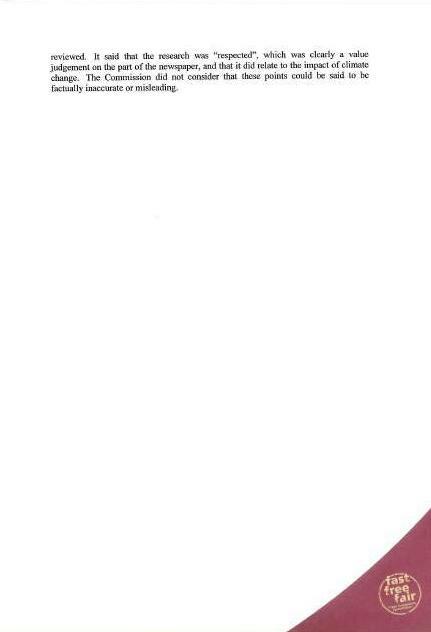 In effect, the Commission is claiming that there are two meanings of the word "supported" – the strict, scientific sense, which it does not dispute, and a hitherto unknown layman's definition. And, without even specifying which meaning it was relying on, the Sunday Times was permitted to rely on this layman's definition. To do so was neither inaccurate nor misleading. The broader implications of this are rather interesting. 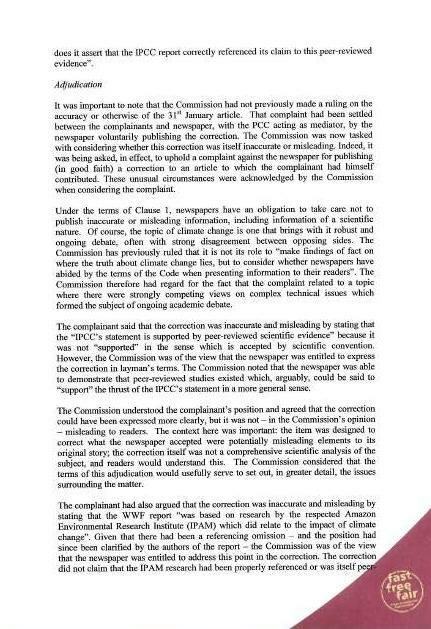 Effectively, the Commission is branding newspapers as "lay" publications, which are thus permitted to use (and rely on) layman's terms, the meanings of which are not recognised in science. 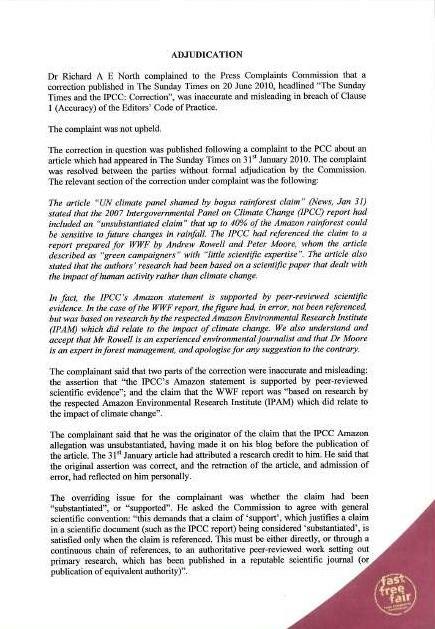 And if the words they use do not conform with general scientific meanings, what their journalists write and what they publish has no scientific value whatsoever. This is the end of popular science as we know it. You might as well buy comics (or nothing at all). The newspapers have written themselves out of the script.